The preview of Office 2013 was launched today, but I’ve had a few days to work with the new software. Here are my first impressions of Outlook 2013--the new e-mail, calendar, and contact hub of Microsoft Office. When I fired up Outlook 2013 for the first time, the first thing I noticed is that it’s cleaner. Outlook 2010 has four panes in the e-mail view--a navigation pane on the left, the Inbox pane, a reading or preview pane that displays the current message, and a pane on the right with a calendar and task list. In Outlook 2013 Microsoft has narrowed it down to just two--the Inbox pane and reading pane--and reduced the left pane to a small menu bar with icons. Microsoft has streamlined the process of shooting off a quick reply in Outlook 2013. Instead of clicking Reply to open up a new email, you can simply start typing and reply inline on the message itself. Outlook 2013's Peeks feature lets you see information without actually switching views. In keeping with the streamlined theme, another new feature is Peeks. Peeks is similar to the Aero Peek capability of Windows 7--they both allow you to take a quick look at your calendar, contacts, or other areas of Outlook without actually switching views. Outlook 2013 still has the social connectors from the previous version that enable you to integrate social networks such as Facebook and LinkedIn. One problem I’ve had in the past, though, is trying to pull contact information from various social networks into Outlook. It often results in multiple entries per person. Microsoft has improved that process with People cards. 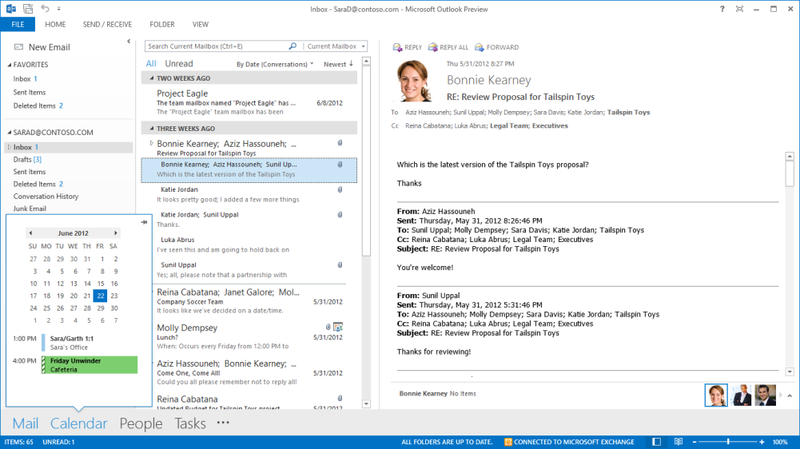 The People cards are the new default view for contacts in Outlook 2013, and Microsoft has designed them to do a better job of merging information and eliminating duplicate entries. The People cards are also available across more Office 2013 applications so you can easily access information about a given contact, including whether the individual is currently available. Users will probably appreciate MailTips. MailTips lets you know things like whether an e-mail you're about to send might be missing a file attachment (if you provide a clue by mentioning an attachment in the body of your message). It can also let you know if the recipient is currently available to receive e-mail--giving you an opportunity to communicate in some other way if it’s an urgent matter requiring immediate response. IT admins in companies that use Exchange Server will appreciate Policy Tips. This feature notifies users if their e-mail messages contain information that might be governed by company security or data-handling policies. It can help raise awareness regarding e-mail content, and can help enforce policies intended to prevent inadvertent exposure of sensitive information. One feature I haven’t really ever given any thought to is embedding the weather in the calendar. Apparently, I’m in the minority, though, because Microsoft has been flooded with requests for the feature, and now it’s here. When you’re in the calendar view of Outlook 2013, a small bar at the top displays today’s weather along with a forecast for the next couple days for your chosen location (or locations--you can add more that appear in a drop-down menu). Like Windows 8 and the rest of the Office 2013 productivity suite, Microsoft has gone out of its way to make Outlook 2013 touch-friendly. You can minimize the ribbon bar to free up as much room as possible for smaller displays like tablets, you can pinch to zoom on messages and calendar events, and you can hold your finger on an item to access the context-sensitive options available for it. The changes in Outlook 2013 don’t look all that dramatic. It seems, rather, that Microsoft’s primary goal was to make the existing Outlook more efficient. I definitely agree that the new features in Outlook 2013 make it easier to access information, so that goal was apparently achieved. If you'd like to check out Microsoft's Office 2013 Customer Preview for yourself, you can download the software here. Steve Ballmer pulls back the curtain on a touchscreen-friendly Office 2013. Office 2013 is touchscreen ready and cloud friendly--and offers smart tweaks to Word and Outlook.